The Anti-cancer Diet was developed after undergoing chemotherapy and surgery for brain cancer, neuroscientist David Servan-Schreiber PhD, asked his oncologist whether lifestyle changes could be helpful for preventing a relapse. When the response was no, Schreiber was skeptical, so he decided to research the matter himself. What he discovered was a large amount of studies indicating that dietary factors, hormones, toxins, unhealthy habits and emotional balance actually do have an impact on the risk of developing cancer. 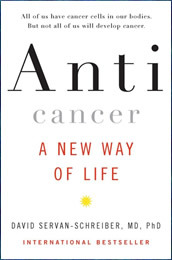 In his book, Anticancer: A New Way of Life, he explores the lifestyle practices that are associated with an increased resistance to cancer and their practical implementation. Servan-Schreiber, who has been cancer-free for the past seven years, accredits his success to a regime that, according to him, enhances the natural defenses of the body. Update:: David Servan-Schreiber, a psychiatrist and best-selling author whose cancer diagnosis at the age of 31 compelled him to explore and then popularize the use of natural and holistic methods in dealing with cancer and depression, died on Sunday in a hospital near Fécamp, Normandy. He was 50.The cause was brain cancer, which had recurred last year, his brother Franklin said. src. Anticancer: A New Way of Life takes a look at the many lifestyle factors that influence our susceptibility to developing cancer. Diet is just one of these elements and the book includes general dietary recommendations based on the latest scientific research. The anticancer diet is composed primarily of vegetables and legumes with olive or flaxseed oil, herbs and spices. Cruciferous vegetables such as broccoli, cabbage, bok choy and cauliflower are especially beneficial. Animal products are optional and should be regarded more as a condiment, rather than the focus of the meal. Because a high intake of omega 3 fats are associated with a reduced risk of cancer, fish such as salmon, sardines and mackerel may be consumed two or three times a week. To reduce the risk of cancer you should stay away from white sugar and flour. If you want to eat dessert the best choice would be dark-colored fruits such as raspberries or blueberries, but a small amount of dark chocolate containing more than 70% cocoa is acceptable as well. Green tea, turmeric, mint, thyme, rosemary, garlic, broccoli, bok choy, cauliflower, Brussels sprouts, cabbage, sweet potato, beets, onions, raspberries, blueberries, cranberries, grapefruit, dark chocolate, multigrain bread, brown rice, quinoa, lentils, peas, beans, tofu, fish, organic meat, omega 3 eggs, organic dairy products. Servan-Schreiber says “exercise has a huge impact on our ability to reduce the biology of cancer”. It is recommended to exercise for 30 minutes, six times a week and to take up yoga or some other form of meditation as part of an anticancer diet. Anticancer: A New Way of Life retails at $26.95. Can help to reduce the risk of cancer or of a cancer relapse. Advice can be used in conjunction with traditional cancer treatments. Acknowledges the role of psychological factors in the promotion of health. The anticancer diet encourages the intake of a wide variety of fruit and vegetables. Includes unique dietary recommendations to reduce the risk of cancer that is based on scientific research. Presents scientific explanations of the mechanisms of cancer in a way that is easy to understand. Author’s recovery from cancer will be inspirational for other cancer sufferers. This anticancer diet does not include a meal plan or meal suggestions. The advice on how to use the recommended anticancer foods is not specific enough. Does not adequately address obesity, which is an important cancer risk factor. Anticancer: A New Way of Life evaluates the lifestyle factors that may help to reduce the risk of developing cancer as well as the risk of relapse. The author provides a comprehensive analysis on how these various elements may be involved in the mechanisms of cancer. This anti-cancer diet is based on scientific research, however it could have been improved with more detailed recommendations and practical suggestions regarding how to implement the beneficial anti-cancer foods into a daily meal plan.